Reposted from @khloekardashian – RP from a 2016 post “Letting go doesn’t mean that you don’t care about someone anymore. It’s just realizing that the only person you really have control over is yourself.” Letting go with love takes great strength. We have to learn to stop taking on peoples problems as if they are our own. Loving people does not mean we have to carry their burdens and confusions on our back. Sadly, You can only express your opinion on a situation. You can’t want their life more than they do. This is in fact their life to figure out on their own and in their own time. I do believe in timing. I do believe timing is everything. You forcing your beliefs and dreams down ones throat is only going to cause resentment and possibly manifest deeper issues. Stop shattering your own heart by trying to make a relationship (friend, family, partner) work that clearly isn’t meant to work. We have to stop trying to repaint people’s colors. We have to learn to believe the love we AREN’T given. You can’t love someone into loving you. (God I wish it were that easy) You can’t force someone to be loyal, kind, understanding. You can’t force someone to be the person you need them to be. Even if it’s for their own good!! Sometimes the person you want most is the person you’re best without. 😩😫 You have to understand… some things ARE supposed to happen in your life, but they just are NOT meant to be. Damn… It took me so many years to understand that. Don’t lose yourself by trying to fix what’s meant to stay broken. God always has a plan even if we can’t understand it (or don’t want to understand it) Even in the darkest of places… Our Lord sees His vision. We might not understand it at the moment but I promise you, your future will always bring understanding & clarity of why things didn’t work out. Don’t put your happiness on hold for someone (family, friend, partner) who isn’t holding on to you. #Agbaya Too much money is disturbing this one here. You are an woman battling cocaine problem? Wow. Sending sense her way. This is not the time to send love and light and recovery her way, because she can get all that. If at 51 she is having this issue, then she needs sense. After all you need money to get addicted to cocaine. She sure has that. So we wish her better days . After three months of doing absolutely nothing in the case Nigerian students, they responding differently to the newsender of suspended strike in different ways. The ones who have moved on with their life in different forms have little or no interest to come back, those who have been praying and crying for this to happen, are having a swell time, while those who have been taking and see long pants will now have a wider range of target. The teachers and lecturers will have been fighting this battle for years, to have the Federal government pay attention to the educational section of the nation. while taking their kids out of the country to school, what then becomes the fate of the children who don’t have such an opportunity? This seems to be the reason why ASUU is fighting on their behalf, but we all know that deep down, it is always more than this. No one really fights for these people without looking out for themselves too. So, let’s just celebrate the call off, and pretend we all don’t know a thing or two. The idle Nigerian Students that have been made to stay back at home by the Federal Government and ASUU since October 2018, have come out to dissociate themselves from the government and the ASSU that has said to be fighting on their behalf. They have said that they have been at home for a long time now, and don’t even hope to be back in school for God knows how long. While Ray Power correspondent went to the ASUU members to ask for their opinion on what the students have said about the ongoing , they responded by saying that the students should have patients and give ASUU a chance to fight their battle for them. They said the fight and strike is for the students and the children to come. Not only for the now. But the Federal government has not said anything about the students calling them out. Why are Lagos parents boldly paying ‘Developmental fees’ to Private schools without investigating? If we as Nigerian masses are not part of our problem in this country, then neither is the Government. How can a group of people who have been tortured and extorted by their leaders for over half a century turn around and become their own problem. A friend of mine just informed me that they have just had their young daughter enrolled into a primary school on Lagos Island, and the fees were incredibly mind burgling. She spotted one of the high fees tagged as a developmental fee, along side tuition and other fees. She made to find out from one of the mother in that school, and the woman told her that it has been this way even before she had her first child enrolled that school. Not sure what the school meant, she went ahead to ask for the meaning of a developmental fee from a staff, and she got the shock of her life, when she as told it is to improve the school. What on earth does that even mean? It is a very clear case of deception and extortion, putting on a very fine gown of disguise. The school had no project at hand, and there wasn’t any visible part of the school in need of urgent fixing. This has been like this for years. Parents paying for developmental fees, without challenging the school, just doing it because the school asked for it. How can you tell me that you parents are in the right place? You would scream and tear down doors with this petty traders on the street of markets at you neighbourhood, but you cant stand your ground when you are being deceived by a white collar pen holding human. Just as long as a name is assigned to the money, you are ready to pay without investigation. You don’t want to complain so the school won’t see you are receiving a broke parent. Just because others are blindly paying, you have decided to equally pay since others are doing it. You parents have to sit up to this country. You can’t change the system of the country from the level of Presidency, you start with where you find yourself. You children’s school is one of those places, your work and home. Dark parents, pay more attention to the he payments you make at school. You might not have a problem paying it, but you are the hope of those who can’t see you it, and need you voice to say “No” to the educational extortion. Just because it has a name doesn’t mean that it is legit fee. Stay woke out there.. These ones have seen things. They have been in strike and labour have gotten their own want. So sad. 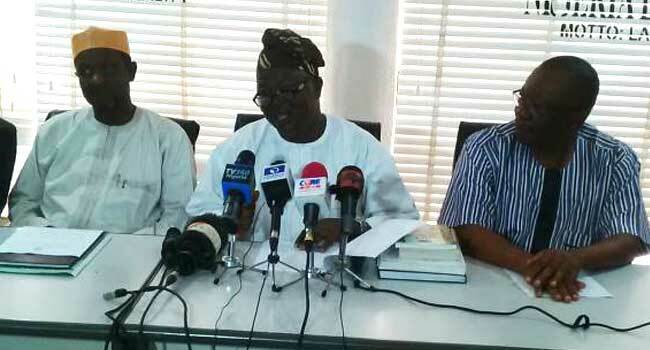 Minimum Wage: Ignore court order, go ahead with strike, civil society group tells labour . A civil society group, Joint Action Front (JAF), said on Sunday it was in support of the new N30,000 minimum wage proposed by organised labour while accusing the government of being insincere and unwilling to pay the proposed amount. JAF in a statement signed by Dipo Fashina and Abiodun Aremu, its chairman and secretary respectively, urged the organised labour to disregard the court injunction procured by the federal government stopping it from embarking on its planned indefinite strike. Following the breakdown of negotiation with the government, the organised labour fixed November 6 as the start of an indefinite strike. The government, however, secured an order from the National Industrial Court of Nigeria on Friday stopping the two main labour unions in the country, Nigerian Labour Congress (NLC) and the Trade Union Congress (TUC) from embarking on the planned strike. JAF said the strike is the only way to get the government to accept the proposed minimum wage. “Minimum wage by law, and by legitimate demand, is for all workers [from level 01 – 17 and other salary scales] in the public and private employment of 50 or more employees. Indeed, for us in JAF, Minimum wage should be mandatory for all employers regardless the number of employees,” the statement declared. The group stated that the federal government as well as state governments will not pay the N30,000 being proposed by labour if not compelled to do so. A labour leader, Joe Ajaero, has declared that the organised labour would never sign any agreement with the federal government on new National Minimum Wage which is less than N30,000. ”N24,000 can never be the new Minimum Wage for workers. If the government pays it, then it is an award,” Mr Ajaero, President, United Labour Congress (ULC), said. Ajaero told reporters in Lagos that the tripartite committee agreed that N30,000 would be paid at the end of its negotiation as the New Minimum Wage for workers. He said it was sad that N30,000 was adopted by the tripartite committee but the representatives of government announced N24, 000. On November 27, 2017, President Muhammadu Buhari, approved the appointment of a 30-member tripartite National Minimum Wage Committee for the negotiation of a new national minimum wage for the country. Nigerians have had enough for the vicious circle of lies and deceit. Nobody will get what they want by sitting down and watching. This to me, it a good way to go about it. Mr Eazi joins the Otedolas in celebrating his girlfriend as she graduates from College. Her father, Femi Otedola, her mother, Nana, her sisters and her boyfriend, Mr Eazi were all in attendance to celebrate with her as she had a family type graduation dinner. Congratulations to her and to him for a long lasting relationship so far. JAMB speaks on reduction in cost of UTME form. First Female Christian Governor assumes office in Egypt. Egypt has the largest Christian community in the Middle East, accounting for around 10 per cent of the country’s mostly Muslim population of 95 million. A Colorado school district will no longer have class on Mondays. According to reports, District 27J is attempting a $1 million experiment this year by cutting the school week to just four days. @FoxNews reports that the new academic schedule is to cut cost and attract more teachers, however there are mixed reviews. The district says they will save money on running school buses and paying substitute teachers, but some parents are concerned about who will watch their children on Mondays while they are at work. “We really feel like Monday is the day to prepare and to be better for kids,” Superintendent Chris Fiedler told @USAToday. “This will give people a chance to have a weekend and then come in on Monday — whether they’re paid to or not because they’re doing that work anyway to be prepared for kids and to be better for—read more on TheShadeRoom.com!